Domain authority. It is important to have a good rating and lots of companies will look for a minmum Domain Authority when choosing bloggers to collaborate with. But what does it actually mean? Today I’m going to explain what your DA is & how to improve it. For the first 7 or so months of blogging, I hadn’t even come across the term before. I saw the ‘DA of 19 or above’ requirements in tweets from PR companies, but didn’t really give it a second thought. First and foremost, in the most simple way, your Domain Authority is a search engine ranking. It shows how well your website will rank on a search engine’s ranking. You can read more about it on the Moz website, who first developed the DA system. It is rated out of 100, with 100 being the best possible score. You can check your own Domain Authority here. What is Domain Authority made up of? Your Domain Authority is made by pulling together root domains (number of other websites that link to your site) and number of total links. There are over 40 factors that are taken into consideration, but these are the two to be aware of. The higher quality of the website linking back to your site (for example, trusted wesbites like google.com or other well-ranking blogs), the better your score will be. If you have less websites linking back to you, or untrusted websites linking to your blog, you’ll have a much lower score. So the key thing to remember here is that when it comes to Domain Authority, the aim of the game is to get as many high quality links back to your website as you can. So, a little more on the scale. All new, self-hosted websites start off with a score of 1/100, which is the lowest. As time goes on, you should be able to build this up to a good score. It won’t happen overnight, but being consistent and working hard to increase it will pay off, whether it takes a month or a year. It is really easy to boost your score up to about 12 or 13, and then things slow down from there. Even some of the best blogs I read, from full time-bloggers might only have a DA of 30, as it takes a long time to build up your score. Google and Facebook have scores of 100. So as you can guess, aiming for a score of 100 is pretty far-fetched. Start small – aim for 30 as a really stong starting score. To give you an idea, I cuurently have a Domain Authority of 19. I went self-hosted in February, so it has taken around 9 months to build up this rating. I am super proud of it already! More on how to do this later on. Does it matter to every blogger? If you are self–hosted, your Domain Authority matters, especially if you are making money from your blog. A lot of PR companies/brands have minimum Domain Authority requirements. Don’t be offended if a company only want to work with those with a higher DA. At the end of the day, they want the best exposure for their product, so choosing someone with a higher DA score makes sense. Remember though, quality of writing, your tone of voice and engagement rate all come into play when a brand chooses which blogger to work with, so your DA isn’t the be all and end all. If you aren’t into blogging for money, then you won’t need to worry about DA as much – it is just a number after all! However, it is worth keeping an eye on, as it will improve your search engine ranking, meaning more people will be able to see your content. In fact, if you search your Domain Authority before you go self-hosted, you might get an amazing looking score like 99/100! This isn’t an acurate rating, so one to avoid. 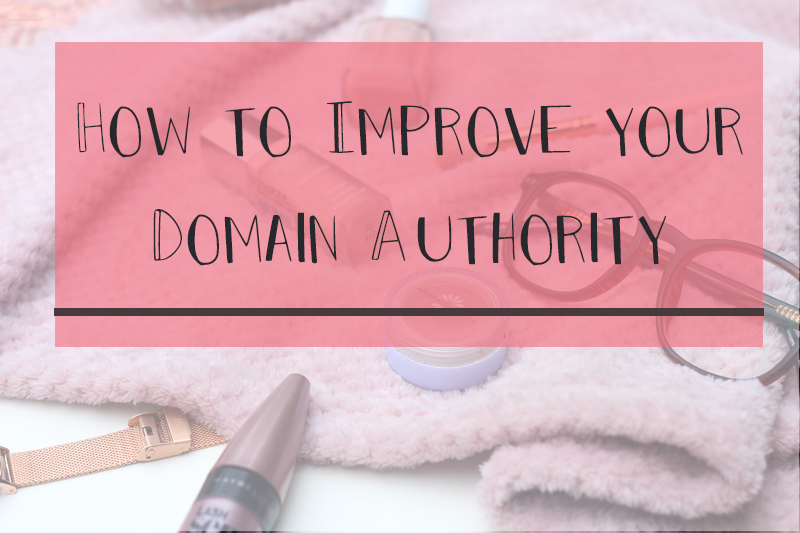 The big question….how do improve my Domain Authority? In the simplest way possible, you need to gain good links to your website -and remove any bad ones. I haven’t had any negative links before, but I know the best thing to do is simply request removal. If this doesn’t work, you need to disavow them. So that is the removal of bad links done. Now for building up a stock of good links! A really easy way is to alwasy leave a link to your own blog when you comment on other people’s blog. Not spam comments of course, always try to leave meaningful comments! But that is a handy way to improve the number of links leading back to your website. No matter what sort of blog you write, a guest post is a great way to recieve a link back to your blog from the other person’s site. You know the sort of thing. ‘Today we have a guest post from Chloe, who writes at (insert useful link back to your blog here)” which will earn you brownie points when it comes to your DA. Look for blogger’s writing in a similar/same niche to you, espcially sites with a higher Domain Authority than you. Every little helps! Search Engine Optimization is another factor that plays into your DA ranking. This includes alt-tags on images, sit structure, keywords, word count etc. If you’re new to any of these terms, head to my Blogging Glossary where I’ve explained what they all mean! Good SEO will help your blog in so many ways, so you really can’t go wrong here. Internal links are just like the one I used in the last paragraph! Linking back to your own blog posts within your writing helps too. To a search engine, all these internal links help connect your site like pieces of a jigsaw, briniging it all together. Link to previous content as much as you can. (There’s another example for you!). Where relevant, use external links too. It all gets a thumbs up from search enginee crawlers. As long as you choose non-spam websites and go for good quality sources! Feel free to leave a comment if you have any questions – let’s get chatting! Next Post The Ultimate, Affordable Christmas Beauty Gift Guide 2017! Thank you so much for this post! I’m just learning about all of this stuff and it gets a little overwhelming, so I appreciate the tips! Being a blog owner this is really informative, I am really unaware about some useful info. Thanks buddy for sharing. I have decided to take into your advice and implement it the way possible. I like the way you have explained your blog post. Thanks for sharing.